Easter holiday 2006: 19 cavedives in Florida. As usual I started a bit out of practise. The best dives of the trip were the ones in the spring I have called "Pocohontas Spring", having promised the property owner not to publish its true name on the Net (if you recognise it from my description, please don't publish its true name either). Many heartfelt thanks to the owner of this wonderful, sidemount-only, not-for-the-faint-of-heart, beautiful spring for allowing me to dive it. The photos you see are all of Pocohontas, and my simple "snappy snaps" camera does not do anything like justice to the beauty of it. Dive 1 of trip - 26/3/06 - Little River Spring, 60 minutes max depth 98 feet. This dive was done so I could find whether I remembered which end of a tank was "up". I could, but was out of practise at fighting my way into a strong spring like Little River (which was flowing strongly as the waters receded after recent flooding). The water was not quite as clear as usual, with other evidence that flow had recently been reversedin the form of various detritus inside the cave. It took me about 20 minutes to force my way to the chimney! Then I toodled off, not very far in, but slowly recovering my sense of familiarity with the place. I was wearing (due to experiments with weights to find what was right for my new drysuit) a weight belt with only 3 or 4 pounds of weight on it. Somehow I contrived to drop it in there somewhere without noticing. I found out this error only when preparing for a cooldown dive at Telford Spring so I determined to go back the next day and try to find it. 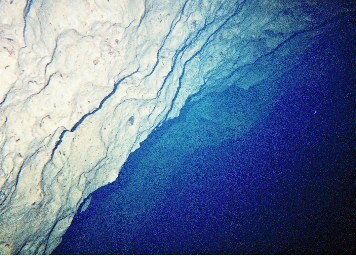 Dive 2 14 minutes, Little River Spring, 27/3/06, max 64', starting pressure 3300 PSI, ending pressure 3000. The dive to retrieve the weightbelt did not take long. It was not far in, lying where it had fallen when I was fighting my way into the spring against the unusually strong current. I must have missed seeing it on the way out - I don't think it could have been dropped on the way out, getting out is so much more peaceful than getting in. Ah well, live and learn. Try not to drop too much more gear on this trip. Dive 3. 27/3/06. 60 minutes at Little River. max 99 feet, SP 3000, EP 1300. So I tie my recovered weightbelt of around a bit of the wooden steps, and I says to myself, "what about a proper dive then". So off I go down the main line, not so very fast, eventually taking a side passage I don't think I'd been in before. It didn't go far. I had a little deco because I had my computer set on air to give myself extra safety margin. As I say, I'm out of practise. Dive 4. 27/3/06. 83 minutes, max 55 feet, SP 3300, EP 1800. Telford spring. Telford also has more silt in the water and is flowing faster than I remember it. Post-flood conditions in other words. I hacked my way in and found a side passage - the one and only side passage in the early part of the cave. This led to another little jump-off-a-jump and then back round to the main line in an oxbow. Continuing up the main line I came across some well remembered territory plus some odd bits that I had forgotten. A couple more jumps to be investigated later. After 60 minutes of penetration I turned the dive and came out a lot faster than I went in. Dive 5. Devil's Ear. 64 minutes max 92 feet. Big Room circuit. 28/3/06. Picked up a buddy at the dive site and he suggested we do this loop. The Big Room circuit involves a right turn at the Grand Junction, (the gap there is a little bigger than I remember it) then round through the Big Room to where the line ends distinctively in the roof of the cave, then a visual jump back to the main line (gold) and down back to Grand Junction. I note the snap-and-gap at the Hill 400 line has been removed. Just a simple jump now. Dive 6. Devils Ear. 64 minutes max 94 feet, Wormhole tunnel. On this dive I took the main line past grand junction to the Hill 400 ine, and then did a bit of the wormhole tunnel. But I had been going quite slowly and couldn't go far in - not getting to the bits of the tunnel I hadn't seen before - for I more or less hit thirds as I hit the tunnel. Next time I will have a buddy bottle same size as my doubles, so I can breathe the doubles down to half and still have the usual 100% safety margin. But really I should breathe less air - still out of practise. Dive 7. Telford spring. 85 minutes max 57 feet, SP 3400, EP 1300. I did the early part of Telford again, coming up to the lowish Posturepedic (?) passage about 500 feet in from the start. I turned there because I wasn't sure if the passage opened out. Apparently it does and I should try it. On exiting I found the lowish passage had had an effect - the left hand post of my doubles was within one turn of being switched off. I shall check this next time I do such a narrow passage. Dive 8. Pocohontas Spring. 64 minutes, max 62 feet deep. By kind permission of the owner I got to do this very pretty dive, which is for sidemount only. The system has three entrances - the first, upstream one a semi-sidemount entrance (you can carry one sidemounted tank but must dismount the other), the second, middle one the main entrance and the third, downstream one the only one from which you can do a backmount dive. 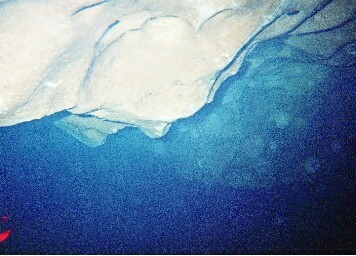 Upstream of Entrance Two is sidemount territory, so as to be kind to the cave. Downstream of entrance two is emphatically sidemount territory, there is absolutely no way you will fit through wearing backmounts. I went upstream from Entrance Two, which leads to the semi-sidemount entrance to air (Entrance One) after about 1200 feet. I did 900 of the 1200' on my sidemounted steel 95s. These worked quite well. I hope to be able to do a photo shoot in this passage as it is very pretty. 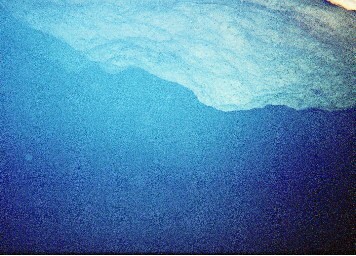 Dive 9. Pocohontas spring. 18 minutes, max depth 37 feet. I went downstream from Entrance Two - into serious sidemount territory, described as "not for the faint of heart" by the property owner. But this dive was cut short when my primary light failed and I swiftly found that though I was still carrying 4 working lights (diving solo I rarely dive with only three) my backup light was not making a good job of cutting through the somewhat silty cave - silt swept down from my upstream dive before lunch the same day. So I turned my dive at a particularly nasty looking restriction - I want full illumination when I try that one! Also, as I turned, one of my regulators started to freeflow. I found that I could very easily "regulate" the flow myself by turning the tank valve on and off with each breath, and eventually the freeflow stopped so I never had to use my backup regulator except for a few seconds when the incident first happened. It surely is nice to know that this regulate-it-yourself trick works so easily when sidemounting. The tank valve is right there by your hand. On the way out I met a very handsome turtle in the cave entrance. Alas he was not as pleased to see me as I to see him, so he scuttled away. Back at Brent's place I stripped my regulators down and found oceans of mud inside, no doubt from crawling through the silty sidemount passages. Sidemounting is hard on the gear in this respect. After cleaning, the offending regulator gave no more trouble. Dive 10. Pocohontas spring, downstream from Entrance Two. 56 minutes, max 54 feet deep. Dive 11. ....and the following morning I was also a much happier, more confident diver. Really this was a little bit like when I first made the decision to be a cavediver (shortly after his wife made my buddy Bernice Constantin promise never to go in a cave, so I knew I would have to be a solo cavediver for the immediate future). A born-again Christian, I prayed about it, and the following morning woke up with the faith, the confidence I needed. I was sure, then, that it was OK for me to be a cavediver. More than OK - I was sure it was going to be fun, and it was. And here on this trip, up until Dive 10 I was really klutzing around, not really doing good dives because timid because out of practise. But during Dive 10 I had mastered a seriously restricted passage where no diver will ever go wearing DIR (backmounted) rig. And I was confident I had mastered it, and the old confidence that I could master and enjoy this cavediving game came flooding back. And today was fun. Yesterday I had noticed how diving in an upstream section meant the downstream section was still silty even after lunch in this system; so I resolved to do the most downstream bit of the system first today. I went therefore to Entrance Three of Pocohontas, and went downstream. 75 minute dive, involving about 1000 feet of pretty, Peacock-springs-like passage though I made a nasty, twisty little entry at the start. Mind you, that's because in spite of the spring pool being only about 15 feet across, I didn't find the "main" entry point at the start and instead went in a side entrance. That was what made it a bit challenging. If instead of 1000 feet you go about 7000 feet downstream, you connect with another well-known system and come out at the river. Awesome traverse that must be! A long combined system then, for Pocohontas itself has a couple of miles of passage surveyed. One day I must do that traverse with the rebreather. Dive 12. Pocohontas Entrance Three, going upstream. 37 minutes, max 51 feet deep. Dive 13 (after lunch). Pocohontas Entrance Two, downstream. 32 minutes, max 51 feet deep. Here I returned to the fairly tight, longish sidemount restriction that held me up on Dive 10, indeeed becoming the be-all and the end-all of Dive 10. Knowing I could handle stuff that size, I was able to go straight through, even keeping ahead of my own silt cloud most of the time. (A tightish downstream passage like this is a bit like an Interstate with a minimum speed limit - if you go above a certain speed you stay ahead of all the silt, if not a cloud envelopes you that may not be quite as welcome as the shekinah Glory of the Lord). The silt cloud only caught up with me once during this dive, and soon after that I caught up with my own hero marker from the previous dive, completing the short traverse after 32 minutes and exiting at Entrance Three. Dive 15. Traverse, from Pocohontas Entrance One to Entrance Two. 48 minutes, max 62 feet. Entrance One is, according to some, a no-mount entrance. It's certainly very twisty. You go in a horizontal opening, down a beautifully formed, white solution tube (later I tried to get a photo of it but my silt cloud caught up with me too quickly) just wide enough for me and my two sideounted tanks (steel 95s), then horizontal again, then a left turn, then another left turn and finally you veer right to the rim of a pit that drops the last 15 feet or so to the main channel. There, as is usual in an offset sinkhole, you have the choice of going upstream or downstream. But before that, at the second left turn at the upper level, is the worst restriction, and it was there that I found I needed to de-kit one of my tanks. (Two attempts at passing the restriction without de-kitting both led to a definite threat of jamming. Which one is wary of, because on a solo dive the only person available to un-jam Little Charles is Little Charles himself). This was my first de-kitting dive except for the entrance to Ilam main rising back in the UK. But I don't really think of that as a de-kitting dive because the place where you have to de-kit is to get under the very first shelf into the cave - you're within 3 feet of air! Though I suppose you could jam and drown even so, in theory. But here the de-kit was definitely inside the system, not very far in but out of the light zone. So, I removed my right hand tank, pushed it in fromt of me to the rim of the pit, put it back on, muttered "any more de-kitting and I abandon this dive" and descended to the more open lower level. Downstream the passage continues fairly low between horizontal planes coloured rusty by minerals in the water. That goes on for about 100 feet, then it opens out and not long after that (another 200 feet) I recovered my hero marker from the previous day. Then it was a simple matter to complete the traverse to Entrance Two. I shot off a few more photos to finish the reel of film. The last is in the entrance pool at Entrance Two, alas without the handsome turtle who would have starred in mid-photo if he had shown up. After I had sorted out this little lot, I dropped down into the pit myself having used very little of my air supply - it's pretty shallow in the upper level of that entrance. Going upstream the passage has very many offshoots, and it gets quite complicated, also it stays quite low. I experimented with one passage, settled on another, placed a line arrow an a doubtful junction (actually Most Doubtful Junction Of Trip - three lines come together in a T, coming back the correct move is to take a right, but the tee is almost hidden under an overhanging rock so it would be easy to go straight on - and there's no marker within twelve feet of it to show the way to air. There is, I admit, a line arrow within eyesight down the exit line but it might as well be on the moon if there was a silt out. A silt out is not all that unlikely with gap from ceiling to mud floor at circa 2 feet. Hence I installed a line arrow right at the tee.). I went on past the 1500 foot marker - from Entrance Two, not Entrance One - eventually turning before thirds because it was really getting very silty and low. Another time I'll come back, I hope, and investigate that upstream section more thoroughly. Getting out of Entrance One worked better than getting in - my Braille is improving daily. Dive 17. Devil's Ear, Hill 400 line, 73 minutes max 91 feet. I met Lance Ohl at the dive site (having previously chatted with him at Little river) so we got to dive together. Irritatingly my gear played up - I'm still relatively new to the new drysuit, and I couldn't get its buoyancy right in the open passages of Devils Ear. I kept getting too much air in my feet. Eventually I got fed up with bouncing alternately off floor and ceiling, and called the dive a little early, apologising to lance afterwards. ("Don't apologise, Charles. ANYONE can call the dive at ANY time for ANY reason". He's one of the good guys, is Lance). Dive 18. Devils Ear. 16 minutes max 64 feet. Trying to sort out my gear I then had a primary light failure in the main entrance. Not my finest hour! Returned to Brent's to sort things out on dry land. Dive 19. Blue Spring, Lafayette county. 76 minutes, max 54 feet deep. With buddy Brent Booth. 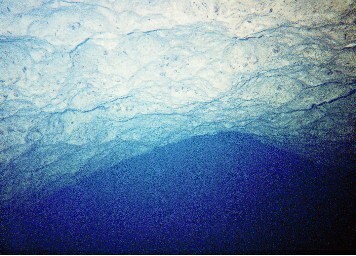 It's been a long time since I dove with my cave instructor! He had a cold or we might have done so earlier on this trip. Blue Spring was my idea, because it has been closed to scuba since before I became a cavediver, but is now open again (due I suppose to an outbreak of common sense in Lafayette County. Many thanks folks!). Now this spring ought really to be called "Green Spring" rather than "Blue Spring" because the water in it contains a lot of green vegetation, flowing pretty fast in places. So you can't see as far as in a clear water system like Litle River or Devils Ear, visibility around 10-20 feet. There's a long sequence of connected sinkholes, ending at the Suwannee River (and the state park). We got in and went upstream for 3 sinkholes. Quite fun, though because of the lowish vis. it will never be Brent's - or my - favourite dive. Being slightly congested I managed to give myself a nosebleed during this dive, my left sinus failing to adjust to the many changes in pressure one inevitably gets when the dive plan involves diving betseen three sinkholes. Ah well. It takes more than that to make me not enjoy a cavedive. A good end to the holiday.